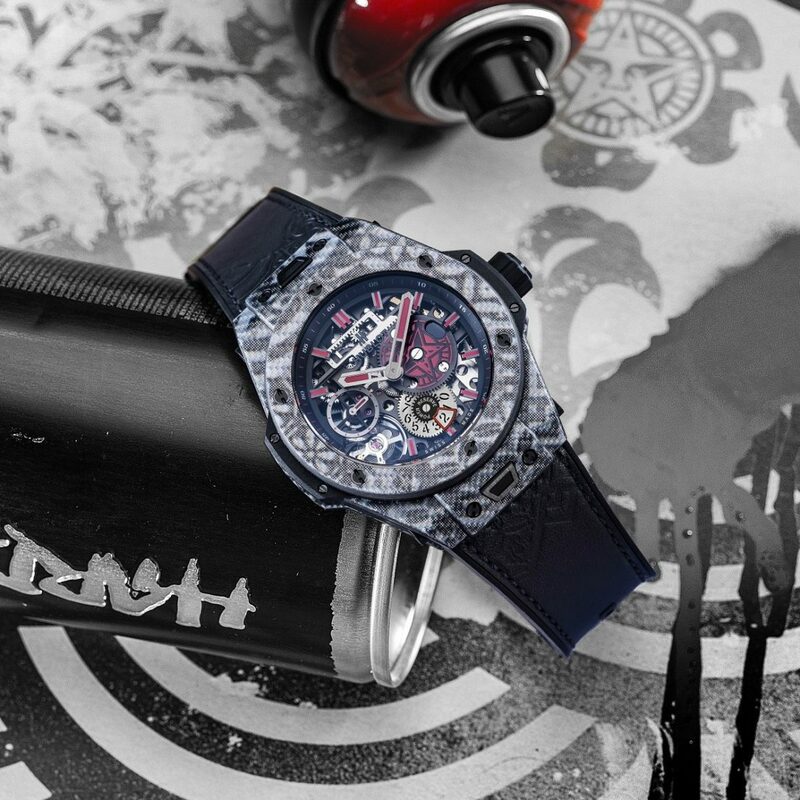 Everyone knows Hublot loves collaborations and their latest project is the Big Bang Meca-10 Shepard Fairey Limited Edition series. 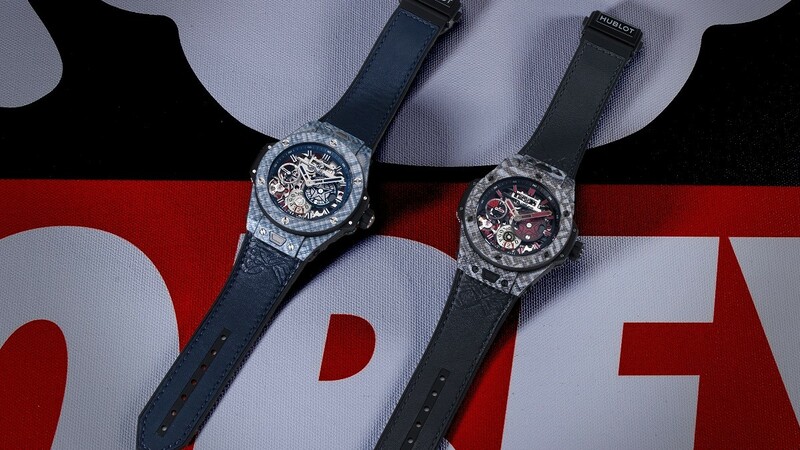 These two watches will be the latest additions to the company’s “Hublot Loves Art” collection. Unless you are a big streetwear nerd, you might be scratching your head at the name Shepard Fairey. However, there’s a good chance that you have seen his work. Remember the Barack Obama “Hope” poster? That was him. He is also the founder of the OBEY streetwear clothing company. The Hublot Big Bang Meca-10, in case you have forgotten, is basically a Big Bang but with a hand-wound movement and we went into more detail about it here. Despite being hand-wound, the Big Bang Meca-10 retains its automatic siblings’ hefty dimensions. The Big Bang Meca-10 Shepard Fairey Limited Edition measures 45mm across and 15.95mm thick. If wrist presence is one of your priorities in a watch, fear not. The Hublot Big Bang Meca-10 Shepard Fairey Limited Edition watches are unique in that they have cases made out of Texalium. First seen in the Big Bang Unico Italia Independent, Texalium is a special type of carbon fiber infused with aluminum. Its unique construction allows Hublot to create carbon fiber cases of various hues and even patterns, which is exactly what they have done here. Available in two colors, the Big Bang Meca-10 Shepard Fairey Limited Edition comes in blue and grey Texalium cases with tribal-like patterns in them. To complement the case, the watches will come with matching blue or grey calf leather and rubber straps with embossed designs by Fairey. The straps can be easily changed out using Hublot’s patented “one-click” strap changing system. The case has a water resistance rating of 100m. Both watches have skeletonized dials with Fairey’s signature ‘Star Gear’ logo at three o’clock being the most prominent feature. The Star Gear turns as the mainspring unwinds and reveals a red dot when the movement is almost out of energy. Complementing this at 6 o’clock is the rather unusual power reserve indicator, which consists of a turning wheel and a red aperture that shows the remaining power reserve in days. At 7 o’clock, you have the balance spring. Since we are on the topic of power reserve, now might be a good time to talk a little about the movement. The movement within is the in-house hand-wound HUB1201. It beats at 3Hz and has a power reserve of 10 days. It is also visible through the sapphire display caseback. Like most of Hublot’s other models, the Big Bang Meca-10 Shepard Fairey Limited Edition watches have bold designs that I think one would either love or hate. I can’t say that I’m overly fond of these new additions, but I do appreciate the interesting use of Texalium for the case. Looking at the press photos, the effect of the Texalium case looks stunning and makes it stand out from the rest of Hublot’s other carbon fiber watches.